You might have heard that the number of government workers has ballooned in Alberta, but this is based on an estimate that Statistics Canada says should be taken with a grain of salt, as the results aren't reflected in more precise measurements of employment. It hit headlines last week that the number of "government jobs" in Alberta had grown by 79,000 in a span of less than four years. That's a big number. But numbers are tricky things. If this is accurate, it means there was a net gain of 1,700 government positions each and every month for 44 straight months. 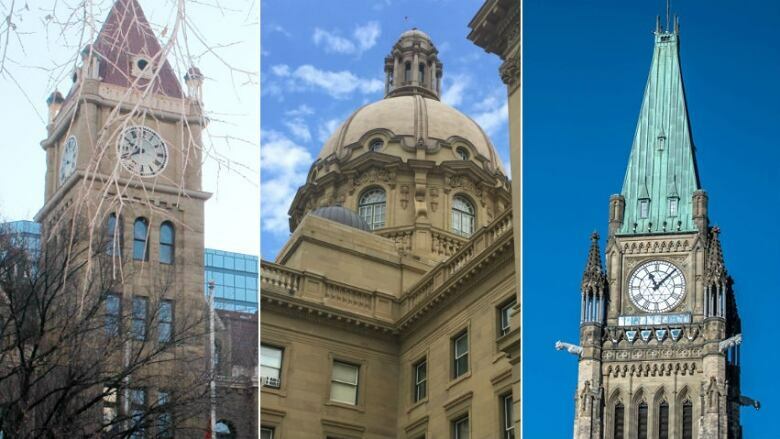 The equivalent of the combined workforces of the City of Calgary and the City of Edmonton would have to be hired — twice — in order to approach that level of public-sector expansion. This number came from a Fraser Institute report and accompanying press release, which were picked up by various news outlets and promoted on social media by various politicians. The implication was that the economic recovery has been dominated by public-sector hiring, rather than private-sector growth. But there's a bit of an issue with the 79,000 figure. Yes, it's derived from a Statistics Canada data set. But it's also contradicted by another StatsCan data set. And that other data set is generally considered to be a more accurate measure of jobs. This other data set suggests the growth in government jobs — at the federal, provincial and municipal levels — was actually closer to 28,000 over the past four years. So what's going on here? How can two measures from the same agency be off by roughly 50,000 jobs? It has to do with the way Statistics Canada gathers its data and what, exactly, is being measured in each case. And StatsCan says it's important to understand both measures before drawing conclusions about what's happening in the real world. The first measure is known as the Labour Force Survey or LFS. This is what the Fraser Institute report is based on. The LFS is a traditional survey. Representatives from Statistics Canada contact households across the country to ask a variety of questions about who is working, how often, and for whom. The other measure is known as the Survey of Employment, Payroll and Hours, or SEPH. This measure, by contrast, is garnered from multiple sources, including payroll-tax data, which is used to count the number of jobs in various industries across the country. 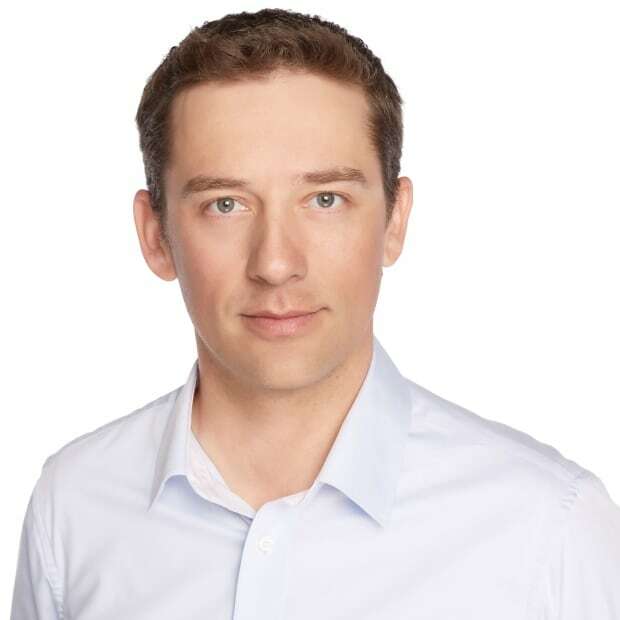 "The SEPH data is really high-quality, because it is based on the administrative data, it's based on tax submissions and social insurance number counts," says University of Calgary economist Trevor Tombe. "And those numbers have a lot more credibility than the Labour Force Survey, because that's just a survey and will be subject to all sorts of margins of error." Another key difference to understand is that these two tools don't measure quite the same thing. While the LFS is a measure of workers, the SEPH is a measure of jobs. Why have two different measures? Because they complement each other, says Vincent Hardy, an analyst with the labour-data division of Statistics Canada. So while the SEPH job counts are more precise, the LFS gives us other information, such as the unemployment rate. Each measure offers its own advantages but sometimes their results can be quite different. The graph below is based on the LFS. It uses the same data that's used in the Fraser Institute report. And, as you can see, it paints a puzzling picture of public-sector hiring, if you take it at face value. The raw LFS numbers show a sudden, massive run-up of 64,500 workers from August 2014 to November 2015. In other words, the majority of the public-sector expansion highlighted in the Fraser Institute report happened in a period of just 15 months. If things actually happened this way, it's worth noting, they would have happened under two different federal governments (one Conservative, one Liberal) and two different provincial governments (one PC, one NDP). Nothing close to that level of hiring is apparent, however, in accountings of government jobs contained in federal reports, provincial budget documents, or the annual reports of the City of Calgary and City of Edmonton, the province's two largest municipal governments. It isn't apparent, either, in the SEPH data. Compared with the LFS, this data takes longer to compile and analyze, so we don't yet have a breakdown for 2018 of government versus private-sector jobs. But we can look at the growth in government jobs up until the end of 2017, which is depicted in the next graph. According to this SEPH data, the number of jobs across all levels of government increased by about 28,000 over the past four years. This total matches more closely with the reporting of full-time-equivalent positions from the federal, provincial and municipal governments. The SEPH data also paints a brighter picture of private-sector jobs. Based on the LFS figures, the Fraser report highlighted a loss of 46,000 private-sector workers from July 2014 to May 2018. So why does the Fraser Institute report rely on the LFS data? It's all about consistency, says Steve Lafleur, a senior policy analyst with the think tank. "We typically use the LFS since it is used as the basis for all major employment indicators, so we pay less attention to SEPH," he wrote in an email. "We use LFS to be comparable with the most widely used metrics, and to ensure continuity between our own studies." Indeed, the LFS does tend to be the more high-profile of the two measures. It's the one you hear about in the news every month when the latest unemployment rate is calculated. Hardy, with Statistics Canada, says the SEPH data is often "underutilized," by comparison, but it's important to consider both measures, especially when they offer such different results. As to why there's such a large discrepancy in this case, he says several factors could be at play. For instance, there are some differences in the way "public sector" is defined in the LFS versus "government sector" in the SEPH. While both measures include taxpayer-funded jobs like nurses, teachers and university professors, the LFS includes Crown corporations, while the SEPH does not. And then, of course, there's that other pesky issue with the LFS — the margin of error. Like any survey, the LFS is not exact. The results are an estimate of what's happening in reality, and that estimate comes with a degree of uncertainty. 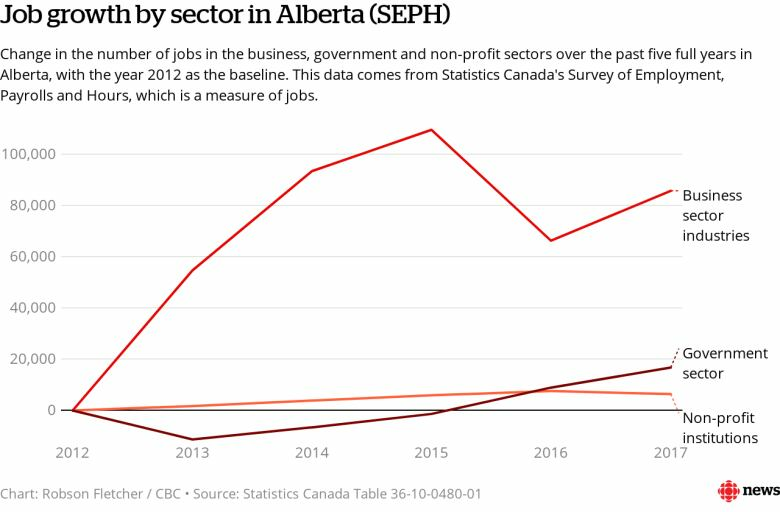 To get a traditional "19 times out of 20" level of confidence, the estimates of public-sector employment in Alberta come with a margin of error of roughly 24,000. 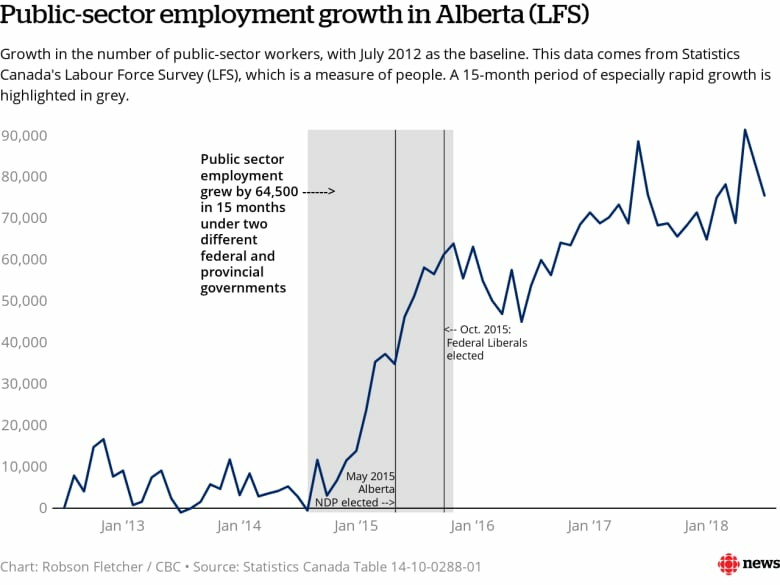 So when the LFS tells us there were 440,000 public-sector workers in July, that means we can be 95-per-cent confident that the actual number of workers is somewhere between 416,000 and 464,000. This inherent uncertainty can create the appearance of short-term swings in employment, even if there's been little change in reality. That's why Hardy says point-in-time comparisons of LFS data need to be taken with a grain of salt. "It may be interesting to look at specific periods, but we also recommend our users not only look at a specific point in time but tend to focus on long-term trends," he says. All this can be frustrating, if you're looking for simple takeaways from the Statistics Canada numbers. But, as an economist, Tombe says it's never easy to get a clear picture of reality from just one data set. "The data might not be measuring what you think it's measuring," he says. "And so you really need to be clear about what exactly is the data saying." Considering the full range of information that's out there, though, Tombe is skeptical that Alberta has truly seen an increase of 79,000 government jobs since 2014. "If I had to bet," he says, "it would be that the actual public-sector employment increased by a lot less than the LFS suggests."